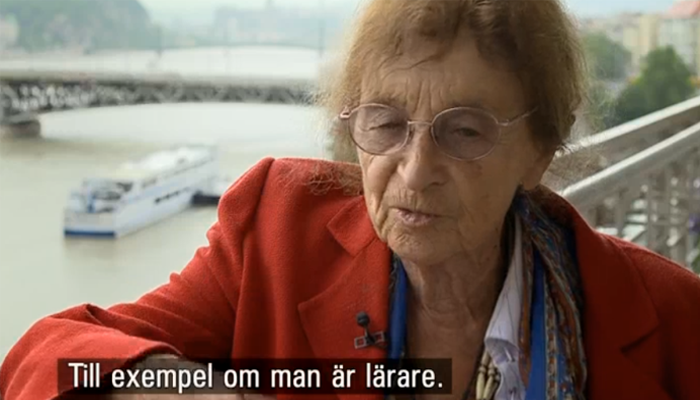 A public argument between government blogger Ferenc Kumin and Hungarian philosopher Agnes Heller has broken out over last Wednesday’s broadcast by Swedish Television of a 28-minute documentary about the rise of political extremism in Hungary and the controversial policies of its conservative, nationalist government. (See earlier article here). Heller was among those interviewed by the documentary’s producers. An outspoken critic of Hungary’s current government, Heller’s reputation for straight-talk can be traced back to her public criticisms of Hungary’s communist era government some forty years ago. In an open letter to Agnes Heller posted on his Facebook page on 24 October 2013 State Secretary for International Communications Ferenc Kumin questions the producers’ intentions and criticizes Heller’s statements as inaccurate. Kumin claims the documentary unfairly portrays the Fidesz-KDNP government in the same light as Hungary’s far-right political party Jobbik. He adds the program’s producers did not seek the input of government sources. “The video does not meet the most basic of journalistic standards”, claims Kumin who dismisses it as mere propaganda intended to smear the government’s reputation. Kumin challenges Heller’s assertion that the Hungarian state-run media and right-wing news outlets with close government ties have a profound effect on shaping the opinions of rural communities. He also dismisses Heller’s claim that high government posts were filled with old friends of Prime Minister Viktor Orban. In the Kobra documentary Heller calls the appointments of old friends of Orban to the positions of President, President of the Parliament, and head of the judicial authority “ridiculous” and “unheard of”, likening the current government to a “mafia”. Kumin responds to these allegations by pointing out that, according to the constitution passed in 2010, the Hungarian parliament elects the President and the President of Parliament, and Hungary’s top judicial official is appointed by the President. Kumin criticizes these statements by claiming that he cannot find a single instance in which any such statement was made by government officials. Instead, Kumin points out that the government’s slogan is “Hungary is performing better”. Agnes Heller immediately responded to Ferenc Kumin’s open letter in the 26 October edition of left-wing daily newspaper Nepszava. She begins by thanking him for making her feel forty years younger as it has been forty years since she was attacked by Hungary’s communist government for giving an interview to foreign “bourgeois media” along with other “anti-revolutionaries”. “It appears the clock has gone full-circle,” she adds. She claims her response has not changed since then: she expresses her own opinion in any forum. She does not ask who else they are interviewing or who the audience is. If anyone is interested in her opinion, she will share it. Heller goes on to say that her statements regarding Hungary’s political situation and its leader would be the same if Hungary’s state-run media were to solicit her opinion. Assuming that were the case, she would not inquire about who else was participating, even if it was, say, Ferenc Kumin. Heller points out that ever since the commencement of the “great Hungarian freedom of the press” her name has attracted only slander in Hungary’s state-owned and right-wing press. Given this fact, she has not even had the opportunity to participate in an interview of the kind Kumin suggested. Heller does not suppose that Kumin actually believes that the three highest public office positions were filled by Prime Minister Orban’s longtime friends simply because following lengthy consideration, the Hungarian parliament was unable to find any candidates more suitable for the position. As for why she used the slogan “work, prayer, nation” instead of “Hungary is performing better” Heller claims she deliberately chose not to quote the latter because she does not believe it to be true.